New affordable housing for low-income seniors is underway in the 31st ward. On Friday, Nov. 14th, Hispanic Housing Development Corporation (HHDC) President and CEO Hipolito “Paul” Roldan, Alderman Ray Suarez, and Mayor Rahm Emanuel broke ground on the redevelopment of the Cicero and George Elderly Apartments as an affordable rental housing building for seniors in the Belmont-Cragin neighborhood. 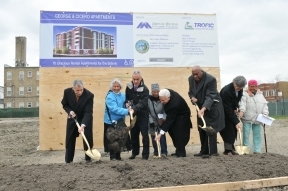 “It was a bittersweet moment for us on Friday when we broke ground on the new Cicero and George Elderly Apartments,” said Roldan. “It took us three years to gain the funding and make people understand that this city needs more affordable housing.” The $21.6 million redevelopment project will provide 70 units for low-income seniors. Approximately, $4 million will be provided from the Belmont Cicero TIF district. The six-story 75,000 square-foot project will include a mix of studio; one and two bedroom unites as well as a fitness center; terrace and community garden. According to Roldan, 61 of the 70 units will be available for seniors on a first-come, first-serve basis whose incomes range between 30 to 60 percent of the area median income, while the remaining units will be provided to seniors at or below 80 percent of the area median income. The Cicero and George Elderly Apartments will be close to City of Chicago’s Department of Aging satellite senior center, which provides a massage therapy room, computer lab and a fitness center. “Thankful for the opportunity to work in collaboration with the City of Chicago and all of our partners to provide high – quality housing,” said Roldan. (Left to right) HHDC President and CEO Paul Roldan, Mayor Rahm Emanuel, Senior Citizen, Alderman Ray Suarez, Managing Deputy Commissioner/Housing Bureau at City of Chicago Lawrence Grisham, and community resident.